We recently reviewed the DigiQuest 6630+USB – now we examine its identically priced sibling. The new 8600CI's front panel may look different but the key difference from the 6630 is the presence of a CI slot. Naturally, this slot (which replaces the 6630's card reader) will give you more flexibility as far as pay-TV is concerned, but it's quite telling that some of the CAMs being sold today are more expensive than this receiver. 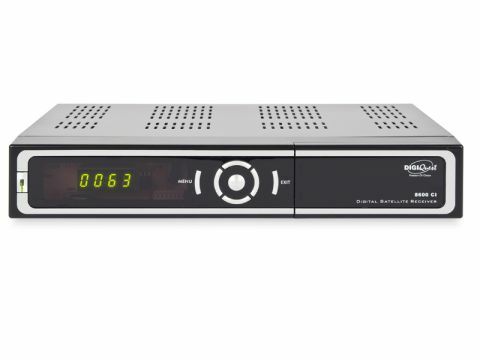 The 8600CI makes no concessions to PVR functionality or HD. But you do get DiSEqC, a UHF modulator, USB connectivity and what Digiquest claims is 'blind scan'. A more serious shortcoming shared with the 6630 is the lack of an EPG. These two Digiquest receivers are, as far as we know, the only ones to lack an onscreen programme guide, yet there's an EPG button on the handset. Compact this receiver may be, but its power supply is built in. On the rear panel are the LNB input and loopthrough output, which are perhaps a little too close together for comfort. There are Scarts for TV and VCR, an RS232 port for firmware upgrades and a series of phono sockets that provide stereo audio, composite video, coaxial digital audio and a programmable 12V output for switchboxes and the like. Operating controls are on the front panel. They include a joypad disc for volume/channel-change, menu access and standby. You can access the menus with these controls, but PIN-protected ones need the tactile but rather busy handset. The single CI slot is behind a flap, beside the USB port. On the opposite side of the front panel is a four-digit LED for channel number and time. The overall standard of construction is high. On one side of the case is the power supply, next to which is a larger board that contains, among other things, the main ALi chipset and CI slot. The tiny Sharp-made tuner lives on a plug-in board with the UHF modulator. In the PIN-protected 'antenna configuration' option of the installation menu – one of five options on a pleasantly designed carousel – you can tell the receiver whether you're using a fixed or motorised (DiSEqC 1.2 or USALS) dish, and select from a list the desired birds. An 'antenna setup' option allows you to select the satellite(s) you've just added and configure them. If you're using DiSEqC 1.0 or 1.1, the relevant switchbox positions for each satellite can be specified. The 8600 CI is compatible with DiSEqC 1.2 and USALS motorised dishes. For the former, east/west movement controls enable you to move the dish until the target transponder is found. Longitude and latitude can be selected for USALS mounts; satellites/transponders can then be selected and the dish moved to the automatically calculated position. Useful features include signal/quality meters, dish-limit setting and the ability to specify the DiSEqC memory location to which a satellite is saved. You can scan a single satellite for free or all channels, with network searching if desired. Another option engages blind search, which merely works its way through a list of pre-programmed transponders. There's no facility for the entry of PIDs, FEC or symbol rates, but you do get a 'multi satellite search' mode that automatically visits each satellite in turn. Sadly, it doesn't account for the time taken to move between satellites. A welcome feature is the 'find' button, which enables you to track down a channel by entering one or more letters of its name. Any channel that stands up to repeat viewing should be placed in one of the favourites lists. There are no fewer than 32 of these. Defining favourites requires the main menu's 'edit channel' option, which has LNB input and loopthrough output TV Scart (RGB, composite) Stereo analogue audio outputs separate radio and TV channel lists. The channel editor will also let you delete, sort (by name or encryption status) or rename channels. Its default PIN protection can be disabled if desired. The EPG may have been forgotten, but there's a manually programmable eight-event timer. Dedicated handset buttons access a sleep timer, engage the onboard teletext decoder, display subtitles, select soundtrack, zoom or freeze the picture of the currently selected channel and toggle between TV and radio mode. There's also a nine-channel mosaic feature that presents you with a live 'thumbnail' of the current channel and still grabs of the eight consecutive ones. Multimedia JPEG or BMP still images stored on FAT32-formatted USB devices can be displayed on your TV. MPEG video clips will play too, but other file formats like MP3 and DivX are ignored. Games Tetris, Othello and Sudoku are available. Pictures from channels that maintain decent technical standards are well defined with realistically rendered colour to the extent where it's difficult to tell the 8600 CI apart from pricier receivers (some of which may even employ the same chipset). Listening to radio stations proves that audio is excellent, too. Searches, menu access and channel-changing cannot be criticised in terms of their responsiveness, but the 8600 CI's sensitivity was found a bit wanting. Reception of the Hot Bird and Astra services was reliable, but trickier transponders on some other satellites proved out of reach. Four thousand channels is a bit on the low side, and on one occasion the review sample ran out of memory. This may not be an issue if you're using a single-satellite setup. But those with the ability to receive more than one bird should stick with FTA-only searches (unless the CAM and card needed to unlock specific channels are available) and delete services of no interest.